City Center Partnership, a downtown development organization, is a business unit of Greater Mankato Growth, Inc. (GMG) which includes the chamber of commerce and economic development organization, Greater Mankato Growth, the local convention and visitor’s bureau, Visit Mankato, and GreenSeam, which utilizes agriculture to build on the region’s extensive agribusiness assets to develop the ag economy. Our mission, as a private/public partnership, is to be a catalyst for implementation of the City Center Renaissance Plan and to support private and public investment in City Center projects, programs and initiatives that attract a greater number of customers, employees and residents to the City Center. 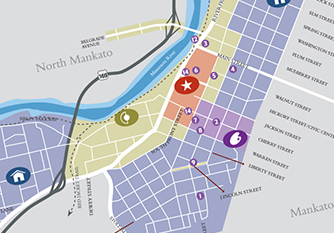 Our vision is a vibrant City Center in Mankato/North Mankato that exemplifies the vitality of our region and attracts visitors, residents, businesses and investment. The City Center Renaissance Plan builds upon our community’s previous planning efforts and reinforces the opportunities that created the historical community in the Valley. The plan calls for a rebirth of the City Center by strengthening the interdependence of residential, industrial, service and commercial sectors through revitalization, reconnection, and reinvestment. The City Center’s strong employment base, civic facilities, historical assets and unique character provide the foundation for the development of strategies that will foster the goals of a Renaissance.